Hello everyone! I have several different things I'd like to briefly announce or bring your attention to, so I decided to tie them all into one post. First of all, if you are here on the hop, welcome! For those of you who are unfamiliar with the Book Blogger Hop, it's hosted by Jennifer of Crazy for Books. To answer this week's question, my name is Liz, and I started my blog because shortly after joining GoodReads, I discovered that some of my friends, namely April of Good Books and Good Wine and Misty of Book Rat, had links on their websites, and lo and behold, these links were book blogs! Maintaining a blog and being a part of the community looked like a lot of fun to me, so I decided to start my own. Second of all, I will be leaving for a family vacation in Maine starting next Tuesday, July 6th and returning home on Tuesday the 13th. My mother grew up in central Maine and nearly all of her family still lives there, so we go practically ever summer. I have included a very silly, squinty-eyed picture of me enjoying a past vacation for your entertainment. We will be staying in a place without internet, so this could mean that my updates will be less frequent in my absence and that I won't be on Twitter as much. I intend to spend part of my weekend scheduling posts. I will have someone keeping an eye on the blog just in case. Third of all, later this month I will be participating in the Got Books event. The event will last from July 23-24 and is essentially a huge giveaway event throughout the blogosphere. I love giving books and bookish items to all of my readers and I'm pretty excited about the items I'm obtained for you all, so I'm really looking forward to this. Fourth of all, while I'm already participating in The Story Siren's Debut Author Challenge, I've decided to join two more. Jessica of Chick Lit Teens and author Kay Cassidy are hosting the 10 in '10 challenge, and the goal behind this challenge is to read 10 chick lit books in the year of 2010. I'm a little bit late in joining, but I actually intend to start out by reading The Cinderella Society by Kay Cassidy as it looks like such a great read. I'm also joining the 2010 Summer Beach Reads Challenge, which is hosted by Jessica of A Fanatic's Book Blog, Heather of A Bibliophile's Paradise, Raila of Books Out of the Bookshelves and Linna of 21 Pages. The goal is to read anything that you would gladly take to the beach for a day. The challenge lasts from July 1st-August 31st and there are four different levels participants can reach. * Tadpole - Read 4 books in this challenge. * Minnow - Read 8 books in this challenge. * Dolphin - Read 12 books in this challenge. * Shark - Read 16+ books in this challenge! My goal is to reach the Minnow level. I think I may count The Cinderella Society for this one as well, along with Sea by Heidi R. Kling. I think July will prove to be a great month for reading and blogging. I can't wait to get started on these challenges! Fun stuff!! :) Have fun on vacation and I hope you get a ton of reading done! Thanks for stopping by my blog! I'm now a follower of your blog now too! It looks like you're doing a lot of challenges, seems like fun. I may join some of them myself. Hope your weekend is going well too! Oh, I'd pick up SEA of our Summer Beach Reads Challenge, too. Better, I will! Thank you very much for participating! Whoa, now that I see all that you've got underway, I think I need to get on board with some of these challenges! We have a new VLOG up on our page. Would love it if visited us and checked it out! Found you on the hop, I hope you enjoy your trip! I'm visiting from the Hop. Enjoy Maine! I look forward to checking our your reviews. Hey Liz! Thanks for stopping by my blog! :D Gotta say, I absolutely love that picture of you in the lobster. Thats one of those pics you need to enlarge and put up on the wall. Also, I really love your layout and design. Looking forward to your future reviews! I am already a follower. I am hopping by to say hi. Have a great weekend. Enjoy your vacation! 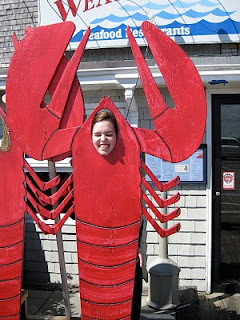 I would love to get to Maine some day! Thanks so much for stopping by my blog. Im now your newest follower. Nice to learn some more about you! Have a good vacation! Thanks for stopping by my blog! I am now a follower. I'm going to Maine in August! Stopping by from the hop. I'm a new follower. Have a great weekend! Stopping by on the hop i am already a follower i have had you on my reader for a while, i hope you like my blog enough to follow me back.